The Jones Library is proud have been selected as the November 2011 winners of the “We Love Libraries” lottery sponsored by Sisters in Crime, an international organization formed to promote the professional development and advancement of women crime fiction writers. 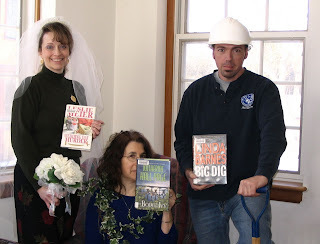 Throughout 2010 and 2011, Sisters in Crime has been holding a monthly lottery drawing of photographs submitted by libraries which depict library staff with three books from the library collection written by Sisters in Crime authors. Each monthly winner receives a grant of $1,000. In the winning photograph, Jones Library staff members posed holding books by Massachusetts member authors. anthology of best crime stories by New England authors. signing. The snow date is Sunday, February 12 at 2 pm. please contact Janet Ryan at ryanj@joneslibrary.org or 413.259.3223.